Paparazzi 1: "We're gonna get some great shots of television and film star Steve Carell!" Paparazzi 2: "Yeah . . . though it occurs to me, our presence clutters up what could otherwise be a striking CelebriGum picture." Paparazzi 3: "You're right! The stark geometry of the scaffolding shadows and the grid of the sidewalk will be much more impressive if we clear the area!" Paparazzi 4: "We can get photos of Steve Carell anytime! Come on, fellas, let's move out of the shot so it'll seem slightly profound." Thanks, guys. I owe you one. What one is Steve Carell? The guy with the giant Yellow Peep or the guy who looks like an orange cone with a big S? 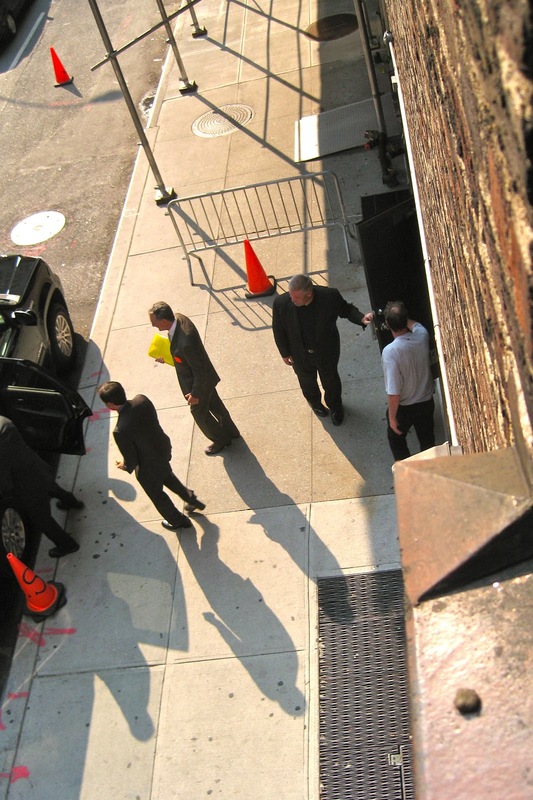 The guy carrying the yellow thing isn't Steve Carell. That's his Yellow Thing Valet. Steve may be the orange cone-shaped thing with the S. I'll have to check my records. Was Steve Carell on the show? Or is it going to air another day? Steve was on the July 19th show. I often hold onto CelebriGum photos for weeks or even months before posting them. Like fine wine, CelebriGum photos get better with age, and also go well with cheese. Or tofu, for the lactose-intolerant.